Hexaflexagons look at first glance to be somewhat prosaic origami shapes – but like mobius strips they hide some surprises. 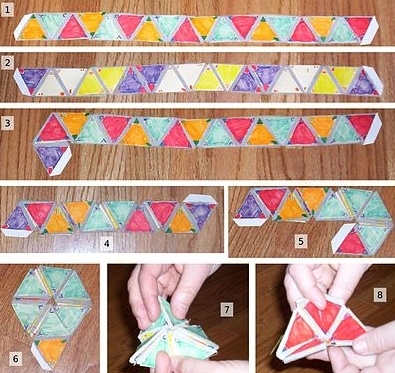 Flexagons are paper shapes that can be folded to reveal hidden faces – and hexaflexagons themselves have six sides. What’s remarkable about hexaflexagons is that during folding, some faces are harder to find than others – which is somewhat counter-intuitive. Surely, you would expect to rotate through the faces equally? Princeton University student Arther Stone discovered flexagons in 1931. After moving from Britain, he discovered that his paper no longer fit his new American style binders – and so after cutting his paper down to size he started to play around with the left over bits of paper. In doing so he discovered a new structure to be explored in the mathematical field of topology (study of shapes and space). If you would like to try and make your own then the template and instructions are available from here. 1) Hold your Hexahexaflexagon flat. 4) Repeat the two previous steps each twice more so you have mountain and valley folds alternating around the six creased edges. 5) If you push the valley folds together, your flexigon will have folded up into a 3-pointed star; a shape that looks almost like a Y from above. 6) With your thumbs grab the point closest to you where the three valleys have come together. You should see that if you pull this point away from the center that the edges fold back down into a flattened hexagon. That sound pretty difficult – but watch the videos again – it should make sense. 1) As you flex your hexa-hexaflexagon (henceforward simply referred to as a flexagon), what happens to some of the faces? 2) What is happening to the flexagon that allows the faces to disappear and reappear like this? 3) How many different faces do you seem to find as you first start flexing your flexagon? 4) Do you think that there might be more faces that can be found simply by flexing? Try to find some and then list those that you have found by listing the markings on the faces. 5) You should see several patterns in the markings on the faces that you have found. Describe these patterns. 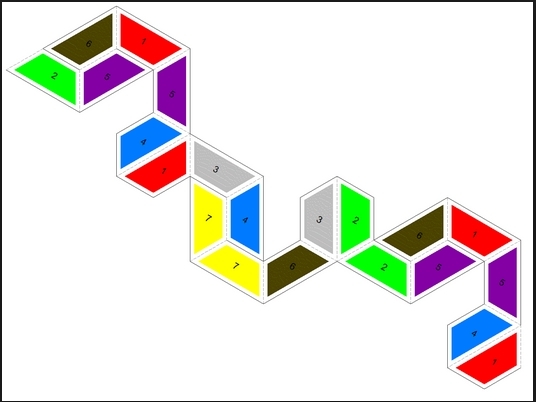 6) Look back at the original strip that you used to make your flexagon. Based on the markings on this original strip, can you guess what other faces should be possible to make by flexing your flexagon? 7) Return again to the original strip you used to create your flexagon. Count how many faces make up this strip. Compare this number with the number of triangular faces that appears on each face of the flexagon. 8) Can you explain why the proper name for this flexagon is a hexa-hexaflexagon based on your investigations so far? Explain. 9) In a given state, how many different ways are there that you can flex your flexagon? 10) In a given state, how many layers thick, including the top layer, are the sections under each triangular face in your flexagon? (Count the two glued layers as a single layer). Hi! Could you suggest which part of the syllabus can I apply on the investigation of flexagons besides the idea of looking for hidden faces and patterns?